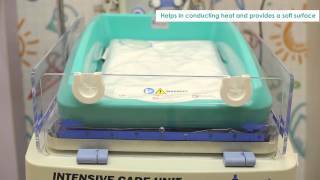 MiraCradle™ – Neonate Cooler is an affordable passive cooling device which uses the advanced savE® Phase Change Material (PCM) technology to induce therapeutic hypothermia among newborns suffering from birth asphyxia. It is easy to use, safe, light weight, portable and gives the precise temperature control of 33-34°C for a period of 72 hours with minimal manual supervision and no requirement of constant electricity supply. MiraCradle™- Neonate Cooler uses the first of its kind – Form Stable Phase Change Material (PCM). PCMs are special thermal energy storage materials that store and release heat at a particular temperature. The thermal energy transfer occurs when the material changes phase from solid to liquid or liquid to solid. The savE® PCMs have been incorporated in a polymer matrix to ensure that when changing phase from solid to liquid PCMs retain its shape and form avoiding any risk of the PCM leaking from its encapsulation, thus making it completely safe for the user as well as the patient. To ensure precise temperature control, MiraCradle™- Neonate Cooler uses a cascaded system of PCMs. Cascaded system is a patented technology that employs use of two or more form stabilized PCM mattresses with melt/freeze at different temperatures. By engineering the melting points, thicknesses, conductivities and placement of the involved layers, a “quasi-automated” cooling system is created, which, while being completely passive, behaves like a servo-automated cooling device. Over 110 babies have been treated using MiraCradle™ – Neonate Cooler and it is currently present in 35 hospitals across 10 states in India. MiraCradle™ – Neonate Cooler will be a good investment for the Neonatologists and Pediatricians dealing with cases of perinatal asphyxia. It is easy to use and affordable in a resource limited setting. It goes without saying that the cooling procedure should be undertaken with close monitoring of the baby. MiraCradle™ – Neonate Cooler is easy to use and the maintenance cost is almost nil. In India, asphyxia results in approximately quarter of the neonatal deaths and is a huge burden on neonatal morbidity and neurodevelopmental sequelae. Hypothermia is the only proven intervention to improve the neurodevelopmental outcomes; but because of the high cost of the currently available machines it is not available to most babies in the developing world. MiraCradle™ – Neonate Cooler is a significant low cost innovation to help such babies in this part of the world. What is the largest weight infant that can safely be held? MiraCradle™ – Neonate Cooler has be used for newborns up to 4 kgs. How long will the PCMs last? Will one set of savE® FS-29 last for 72 hours? How to clean the PCMs and other components of the device? Will the Cradle fit in the bassinet of a regular radiant warmer? Yes the re-warming after 72 hours has to be done manually using the radiant warmer at 10-20% output level. of invoice to the original purchaser. PLUSS will have the right at its expense to inspect and have returned any Product claimed by Buyer to violate this "Warranty." the Warranty only for the remainder of the original warranty period. 1. The delivered product is altered or damaged. 2. The product is not properly installed, handled, stored, maintained and used in accordance with the User Manual. 3. The product is repaired by someone other than the manufacturer or its authorized distributor. 4. The product is damaged by negligence or accident. 5. The claimant is not the original purchaser of the product. representation or warranty, whether expressed or implied. the product for use in caring for birth asphyxiated (HIE) neonates. 5. Warranty claims are not valid against acts of God like fire, floods etc. 6. All warranty claims are subject to the legally accepted force majeure clause. of third parties including buyer's customers.